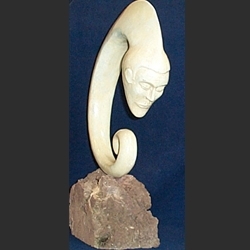 17" high x 4" x 9"
Air on Lava is a bronze sculpture on a lava base. The facial expression seems more grounded than the spiritual expression of Air on Glass. A six-week waiting period is needed for the casting. A 50% deposit (2500.00) is required.